The 100th Tour De France Wraps Up With A Win For The British : The Two-Way Organizers feared this year's Tour wouldn't generate the excitement of previous years. Not so. 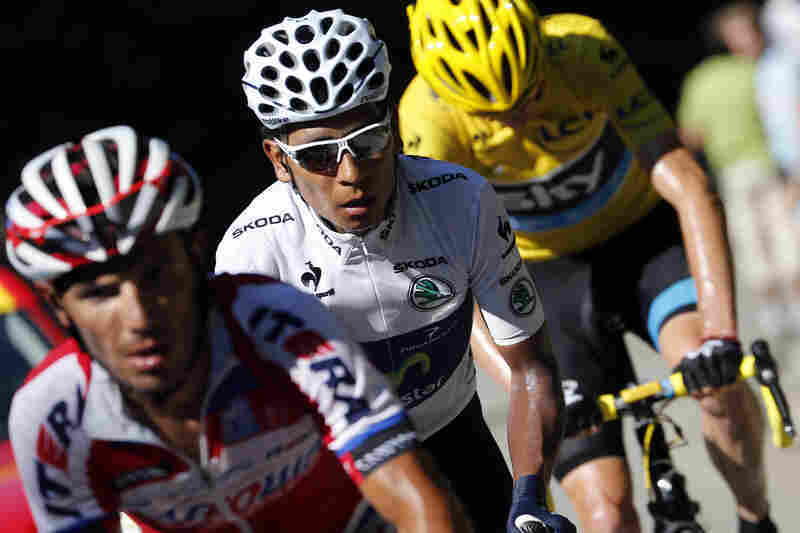 Yellow jersey winner Christopher Froome of Great Britain and second-place Nairo Quintana of Colombia raced neck and neck on the final climb during stage 20 of the 2013 Tour de France. Spain's Joaquim Rodriguez Oliver rides ahead of Colombia's Nairo Quintana in the coveted white jersey and Britain's Christopher Froome in yellow during the 75-mile 20th stage of the Tour. 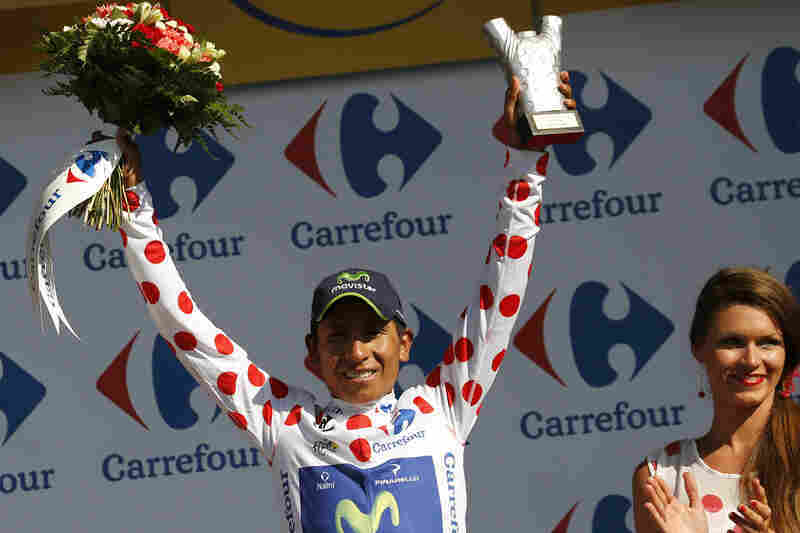 Colombia's Nairo Quintana celebrates his polka dot jersey, which signifies he's the best climber. In addition to be "King of the Mountains" jersey, Quintana also bears the white jersey signifying the best young rider. 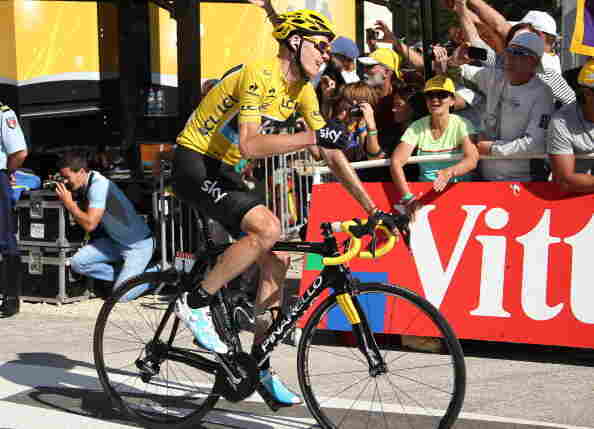 Race leader Christopher Froome of Great Britain finishes Stage 20 of the 2013 Tour de France, clinching is his win of the 21-day race. The City of Light is, in fact, lighting up for an evening showdown on the final day of the Tour de France. In a break with tradition, the 21-stage cycling race is starting later than usual from Versailles and ending 83 miles later in Paris with 10 laps of a circuit up and down the Champs-Elysees. Yet the winners of the 100th Tour de France were pretty much set on Saturday at the end of the 20th stage. For the second year in a row, a Brit is taking the coveted yellow jersey grand prize. Last year, Chris Froome was part of the two-man Britannia triumph when he came in second after his teammate, Bradley Wiggins. This year, the Nairobi-born Froome is finishing the race with about a 5-minute lead over the second-place cyclist, Colombian Nairo Quintana who, it's fair to say, has triumphed in his first-ever Tour de France. In addition to coming in second overall, Quintana is expected to hold two other distinctive jerseys: The polka-dot jersey for best climber (aka "King of the Mountains") and the white jersey for best overall young rider. Even though Froome spent the better part of the Tour holding the yellow jersey, he told reporters after Saturday's stage that it wasn't until he passed the sign indicating 2 kilometers to go to the finish that he let himself believe he was actually going to win the Tour. "It actually became quite hard to concentrate," he said. "A very emotional feeling." In general, Tour de France organizers have been a bit worried how this year's race would play out. It's first Tour since American Lance Armstrong admitted to using performing enhancing drugs and forcing his teammates to do the same during his racing career. Sponsorship for the Tour itself was down and race organizers were worried about the Tour's ability to attract its usual global excitement. Their concerns proved unfounded, as it turns out. According to Sports Media Watch, viewership was up nearly a third over last year, plus hundreds of thousands of fans came out to stand by the race course and watch the cyclists whiz past. As far as accidents and mishaps — or, as NPR's Mike Pesca called it on Weekend Edition Sunday, chaos, — there were relatively few in this year's race. Perhaps it helped that the weather cooperated, but there were only a few crashes that forced riders to drop out of the race. @dwuori why all the sudden shock and outrage. this has been happening for 100 years in some form or another. piss, spit, fists, etc.